AUTHORS OF THE publishing phenomenon Oh My God, What A Complete Aisling have signed a two-book deal, with the possibility of a film deal, to continue the story of country girl Aisling as she makes her way in the world. The novel has been an outstanding success, remaining at the top of the bestsellers list since it was published in late August. Authors Emer McLysaght and Sarah Breen met in college in Dublin and bonded over being from Kildare and Carlow. The witty pair were inspired to create the character Aisling around 10 years ago after meeting lots of girls like her. When they set up the Oh My God, What A Complete Aisling Facebook page a number of years ago to catalogue Aisling’s life and the antics of her friends and family, they never dreamt it would end up being so popular. But the page now has over 40,000 members. 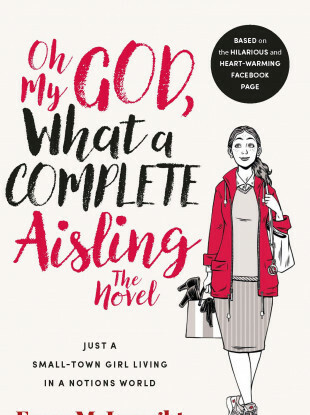 This year, Aisling has proved to be such an enduring character that the pair secured a book deal with Gill Books and published their debut novel – Oh My God, What A Complete Aisling. It has been announced today that McLysaght and Breen have signed a two-book deal to continue the adventures of Aisling. A film deal is currently being negotiated by Curtis Brown. “One piece of feedback we’ve had time and time again is that Oh My God, What A Complete Aisling is now set to emulate the success of Ross O’Carroll-Kelly,” Commissioning Editor for Gill Books, Conor Nagle said. The authors have already begun working on book two, due to be published in Autumn 2018. They are keeping the plotline firmly under wraps, for now, just hinting that Aisling will be spending a lot more time “down home”. Email “Oh My God, What A Complete Aisling authors sign two-book deal with possibility of film deal ”. Feedback on “Oh My God, What A Complete Aisling authors sign two-book deal with possibility of film deal ”.